Smooth, delicious and creamy! 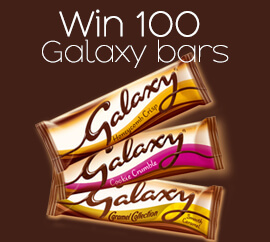 We all love Galaxy chocolate which is why we are giving one lucky winner the chance to win not one, not two but 100 Galaxy chocolate bars! Chocaholics will love this great prize – stick the kettle on, put your feet up and enjoy the delights of smooth Galaxy chocolate every day for 100 days! All you need to do is enter today for your chance to win!